Diagenode offers huge selection of highly sensitive antibodies validated in IF. HeLa cells transfected with a Cas9 expression vector (left) or untransfected cells (right) were fixed in methanol at -20°C, permeabilized with acetone at -20°C and blocked with PBS containing 2% BSA. 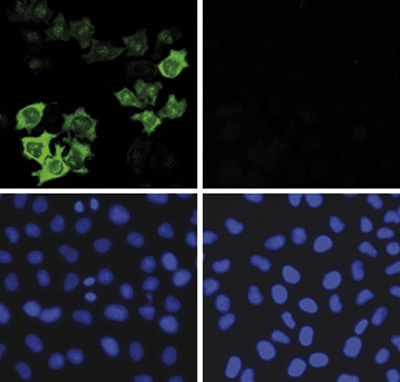 The cells were stained with the Cas9 C-terminal antibody (Cat. No. C15200229) diluted 1:400, followed by incubation with an anti-mouse secondary antibody coupled to AF488. The bottom images show counter-staining of the nuclei with Hoechst 33342. Check our selection of antibodies validated in IF. Add EGFP polyclonal antibody - Classic to my shopping cart. Add HDAC3 monoclonal antibody - Classic to my shopping cart. Add MECP2 monoclonal antibody - Classic to my shopping cart.